This 79Ha* private and secluded property boasts frontage to the Coldstream River, and while our vendor has run it as a productive farm, they have certainly appreciated the lifestyle perks here as well. Historically the property has consistently and capably carried 90 cows and calves. At present, there are approximately 65 cows and calves and a dozen steers running on the paddock, with an abundance of feed available. The property is divided into two main paddocks and the land has been soil tested and improved according to the results of these tests. Ongoing maintenance and a solid fertiliser history are evident here. Every year there has been seed, fertiliser and/or lime spread on the property, and regular slashing and spraying has been carried out. Fencing overall is in good condition, and there is a set of shady timber stock yards with loading ramp, headbale and crush. Blue couch and water couch are in abundance and ideal for fattening cattle for a variety of markets. Our vendor has planted Oats/Rye Grass every autumn ready for winter, which is then followed up by the growth of about 100 acres of water couch coming into Spring. Locals of the Clarence Valley will recognise this paddock as being bounded by the Coldstream River at “The Forks”. Keen fishermen should note that bass and flathead are often in abundance here, and wildlife lovers will enjoy the multitude of birds and native animals that live on the swamp. A number of substantial water holes/dams provide water to cattle on the property and there are two mounds alongside these water holes which will provide peace-of-mind for flood times. This property is identified as Lot 12 in DP 1204552. The property is just 4.5km from the General Store in Tucabia, 12km from the village of Ulmarra, and 26km to Grafton. Access is off Wooli Road (sealed bitumen road) then via a Right of Way gravel track access, leading to a Public Road access (which is a continuation of the gravel track). The figures here speak for themselves 195+ acres* with a carrying capacity to handle 90 cows and calves. Here is an opportunity to purchase a productive cattle block priced to achieve a prompt sale. 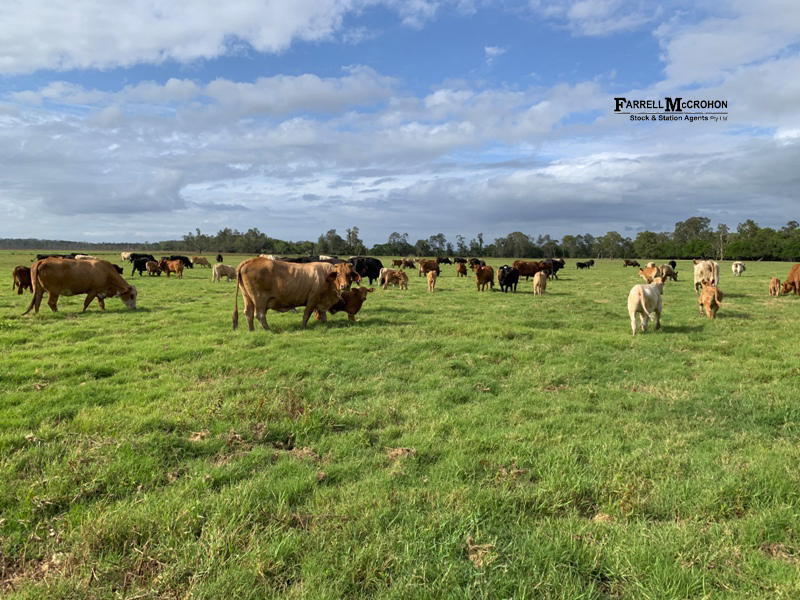 Inspection is by appointment only; phone JoJo Newby of Farrell McCrohon Stock & Station Agents on 0417 690 637 to discuss further. NOTE: * Measurements, boundary lines and land sizes are approximate and indicative only.